Weel are ye wordy of a grace As lang's my arm. While thro' your pores the dews distil Like amber bead. And then, O what a glorious sight, Warm-reeking, rich! Then auld Guidman, maist like to rive, 'Bethankit!' hums. Looks down wi' sneering, scornfu' view On sic a dinner? Tho' bluidy flood or field to dash, O how unfit. An' legs, an' arms, an' heads will sned Like taps o' thrissle. But if ye wish her gratfu' prayer, Gie her a Haggis! 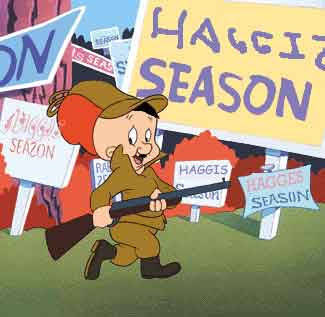 Today is the brithday of Scotland's favourite son Robbie Burns, who penned the above ode to haggis. Tonight, in Scottish enclaves worldwide, the above poem will be recited before participants sit down to enjoy their main course - haggis. If you're curious as to the ingredients of this Scotish delicacy, a recipe for haggis can be found here. And if eating haggis doesn't appeal to you, perhaps you'd like to engage is some haggis hurling, which some might say is all it's good for!